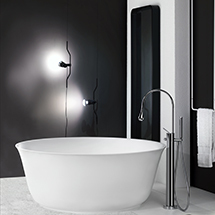 Gessi is proud of its strong production roots and remains unwaveringly Italian. From a single location in Vercelli Italy, the unique ‘Made in Gessi’ production process embodies the ‘Made in Italy’ philosophy that highlights Italian elegance, aesthetics and lifestyle. Be a part of the process and witness the craftsmanship of the NEW Gessi 316 tapware range. Mimicking elements of leather and luxurious indentation the Gessi 316 mixer will add elegance and style to your bathroom, kitchen or laundry. Available in brass, black, brushed metal, chrome and polished finishes.